Part two of a series of five posts on recommended items (as requested by Makeup Bootclass students). See here for the first in the series. 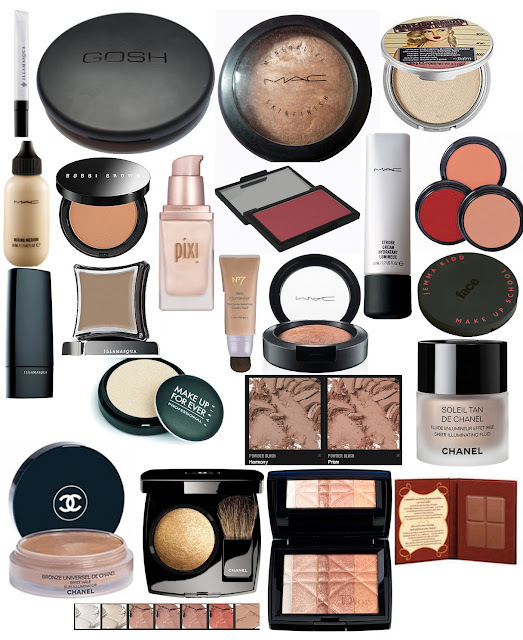 This post covers "face" items (ie Bronzer, Contour, Blusher, Highlighter, Illuminator). These product recommendations are listed here. There are lots of bronzers available. I recommend having one matte bronzer for the winter time, and one shimmery bronzer, slightly darker, for summer use. I personally prefer to use a cream for contouring, however powder variants are also available. Both of these recommendations are for light-medium skin shades. Darker skins will require a much darker shade for contouring; depending on the shade and undertone of the skin, you may find that a dark eyeshadow or a really dark foundation will work the best. In general, more ashy tones work better for contouring, and it's better not to use a product with glitter or shimmer for contouring - you're trying to sculpt the face by creating the illusion of shadows (or exaggerating those already there), and shadows don't shimmer! Sleek Blush The Sleek blushes are very highly pigmented, very good value for money and there's a wide range of colours. The matte ones can look a little chalky, but you can just brush over with your foundation brush afterwards to minimise the "chalkiness", or spritz on a finishing spray (see here). These belong with the highlighters, really, as most of them are usable as liquid highlighters, as well as illuminators. As illuminators, these can be mixed with foundation, moisturiser or primer or used on their own. Illuminators can be used on the high points of the face (like highlighters) but can also be used all over your face (assuming they're not too metallic or shiny) to give you a "lit from within" glow, or (like highlighters) on your collarbones, down the front of your shins, etc. All these here are liquid products.